Employment - Bluewater Constructors, Inc.
Bluewater is an Equal Opportunity Employer. Bluewater (BWC) manages its projects with a hands-on approach from the estimating phase through construction and owner acceptance of the project. We do this through the utilization of professionals in various key roles. BWC is progressive in the use of state of the art computer systems and software to manage, estimate, schedule, track progress, and perform accounting, purchasing, payroll and reporting of our projects. We look for our staff to be computer and systems knowledgeable and to become proficient in the BWC systems. If the BWC approach is what you are looking for and you have the qualities listed below, please click apply now and fill out our online application. We look forward to hearing from you. Five to fifteen years experience managing and coordinating project activities between the home office and the construction job site. Maintain working relationship with the client project manager. Work with the project superintendent to plan, schedule, monitor, and report progress. Maintain project files and records. Proficient in project communications and reports. Five to twenty years of experience in the management of heavy industrial construction projects of 25 to 100 staff, focused on Natural Gas Compressor Stations. Experience in managing all disciplines of a project from site development to commissioning. Familiar with and the use of schedules and project controls to manage a project. Functional understanding of field office systems and processes. Promote and enforce the company safety program. Assure the quality requirements of the project are met according to the contract. Relocation and travel throughout the United States is required. 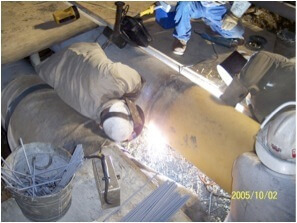 A field assignment to assist the construction superintendent in execution of the project. Two years minimum experience is required. Maintain project documents, update schedules, and perform project controls reporting. Assist the superintendent in quality control testing, verification, and record keeping. Promote the company safety program. Competent with MS Office Suite, as well as able to learn new software. Experience with Sage Timberline Accounting or similar a plus. A safe working environment is the product of involvement by all participants from the planning stages through project completion. We are committed to protecting our employees, the environment, as well as the general public during every project.